One moment, completely human and modern-day Carrie Morgan is crocheting in her living room. The next second, a peach alien claiming to be a Celestial Mates agent transports her and her dog four hundred years into the future. He leaves her there to be discovered by her supposed fated mate�a blue-skinned cyborg general. The sly agent failed to mention a few things, like the fact humans and cyborgs are at war with each other! She�s certain Freydon Rote is crazy, but as she gets to know the cyborg general, she realizes maybe there�s something to the claim that DVS84 is meant to be her mate. Passionate nights further convince her that perhaps she�s in the right place at the right time to find her happy ending�if she survives all the challenges of her new environment. Can a human woman find true love with a cyborg general fighting against her species? 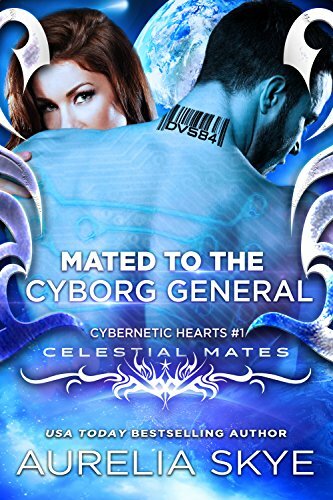 Find out in this latest installment in the Celestial Mates (and first in the Cybernetic Hearts) series, brought to you by USA Today bestselling author Kit Tunstall, writing as Aurelia Skye.